The lectures this time have focused not on the work of an individual director but rather on a particular genre: film noir. 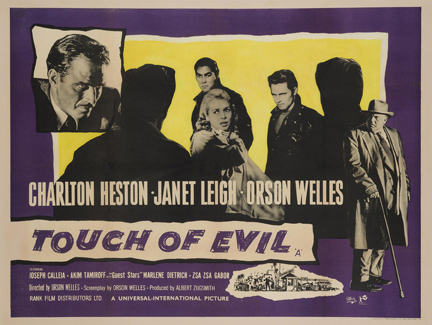 All four movies are considered classics of the genre, from “The Killers” (based on a Hemingway short story, with Burt Lancaster in his film debut) to what is generally viewed as one of the last examples of film noir in its classic period, “A Touch of Evil” (written and directed by, and starring Orson Welles). 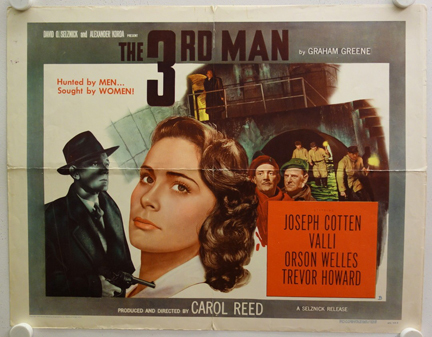 Welles appears also in “The Third Man” (original screenplay by Graham Greene), with Joseph Cotten, who was the star of one of Hitchcock’s great noirs, “Shadow of a Doubt” (1943). On view will be the work of a number of classic movie stars: Ava Gardner, Edmond O’Brien, Robert Mitchum, Jane Greer, Trevor Howard and Kirk Douglas, in one of his earliest roles. That might be the best approach for anyone seeing the film for the first time: to set aside the labyrinthine plot, and simply admire what is on the screen. Mark Schenker’s lectures are accompanied by clips from the films to illustrate the points he is making. His previous lectures on the films of Alfred Hitchcock, Stanley Kubrick, and Billy Wilder (among others) and the historical context in which the TV series “Downton Abbey” took place were erudite and entertaining. The haunting music of a zither, the ring of Vienna’s cobbled streets and a ghostly Graham Greene story, about a man-hunt in that seamy capital flow smoothly and beautifully together into one piece of top screen artifice in Carol Reed’s most recent (and most touted) mystery-thriller-romance, “The Third Man.” Trailing Continental glories and faint echoes of that zither’s weird refrains, this extraordinarily fascinating picture began a run at the Victoria yesterday. But we feel we are bound to inform you that our key word is “artifice” in that thoroughly enthusiastic introductory paragraph. For the simple fact is that “The Third Man,” for all the awesome hoopla it has received, is essentially a first-rate contrivance in the way of melodrama—and that’s all. It isn’t a penetrating study of any European problem of the day (except that it skirts around black-markets and the sinister anomalies of “zones”). It doesn’t present any “message.” It hasn’t a point of view. It is just a bang-up melodrama, designed to excite and entertain. The lectures this time focus not on the work of an individual director but rather on a particular genre: film noir. 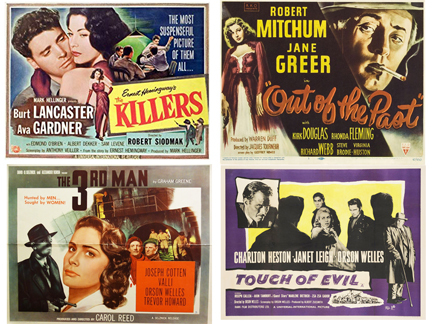 All four movies are considered classics of the genre, from “The Killers” (based on a Hemingway short story, with Burt Lancaster in his film debut) to what is generally viewed as one of the last examples of film noir in its classic period, “A Touch of Evil” (written and directed by, and starring Orson Welles). Welles appears also in “The Third Man” (original screenplay by Graham Greene), with Joseph Cotten, who was the star of one of Hitchcock’s great noirs, “Shadow of a Doubt” (1943). On view will be the work of a number of classic movie stars: Ava Gardner, Edmond O’Brien, Robert Mitchum, Jane Greer, Trevor Howard and Kirk Douglas, in one of his earliest roles. Most crime movies begin in the present and move forward, but film noir coils back into the past. The noir hero is doomed before the story begins — by fate, rotten luck, or his own flawed character. Crime movies sometimes show good men who go bad. The noir hero is never good, just kidding himself, living in ignorance of his dark side until events demonstrate it to him. 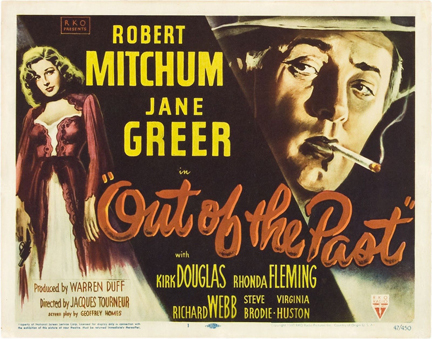 “Out of the Past” (1947) is one of the greatest of all film noirs, the story of a man who tries to break with his past and his weakness and start over again in a town, with a new job and a new girl. The movie stars Robert Mitchum, whose weary eyes and laconic voice, whose very presence as a violent man wrapped in indifference, made him an archetypal noir actor. Like many artistically ambitious Hollywood movies of the 1940s, “The Killers” is clearly influenced by “Citizen Kane” — not just in its Expressionistic lighting, showy camera angles, carefully contrived mirror shots and percussive montage but also in its flashback structure. Its dramatic personae, however, are pure pulp. Less a narrative than a Hollywood neighborhood, “The Killers” is populated by slang-slinging tough guys with tilted fedoras and dangled cigarettes and gorgeous dames who are not to be trusted. O’Brien is a low-rent Humphrey Bogart. Lancaster is dreamy, dense and doomed. Ava Gardner, in her first major movie, doesn’t do much more than exist. She hardly needs to. Film Screening: Mark Schenker, Dean of Yale College, presents Alfred Hitchcock’s “Rear Window” Sun., Sept. 30, at 2 PM. Mark Schenker, Dean of Yale College, presents a screening of Alfred Hitchcock’s classic movie “Rear Window” on Sunday, Sept. 30. The event starts at 2 pm. 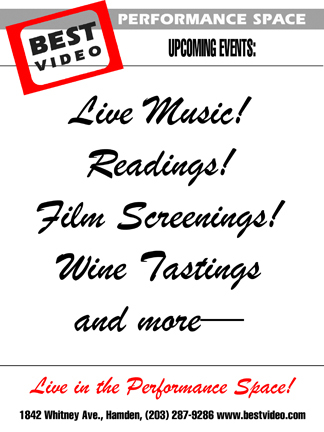 Admission is free but Dean Schenker will be encouraging attendees to make donations to support Best Video Film & Cultural Center. Dean Schenker has earned a loyal following at BVFCC for his lecture series “How to Read a Film.” Whether focusing on a genre (like film noir) or the work of a particular director, Dean Schenker uses well-chosen clips to offer up entertaining close readings that analyze both the formal cinematic aspects of movies as well as the themes, psychological undercurrents and plot devices. Where Dean Schenker uses clips to explicate his “How to Read a Film” lectures, he will be showing “Rear Window” in its entirety. 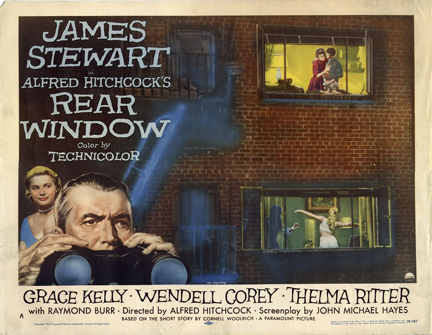 “Rear Window,” released in 1954 and starring James Stewart and Grace Kelly, is an iconic film in the Hitchcock canon. The hero of Alfred Hitchcock’s “Rear Window” is trapped in a wheelchair, and we’re trapped, too–trapped inside his point of view, inside his lack of freedom and his limited options. When he passes his long days and nights by shamelessly maintaining a secret watch on his neighbors, we share his obsession. It’s wrong, we know, to spy on others, but after all, aren’t we always voyeurs when we go to the movies? Here’s a film about a man who does on the screen what we do in the audience–look through a lens at the private lives of strangers. Dean Schenker’s next lecture series—”How To Read a Film—A Quartet of Noir”—begins Sunday, Oct. 28, at 1 PM and continues for three consecutive Sunday afternoons following.